I am a fourth year Ph.D. Candidate in the Computer Science Department at the University of California, Los Angeles. 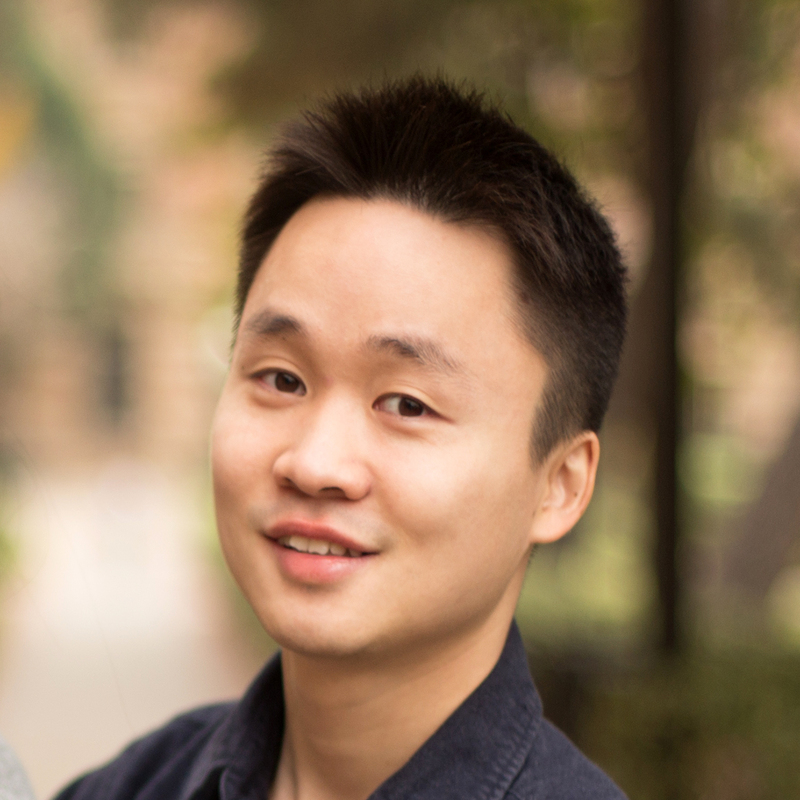 I am currently doing computer vision research in the Center for Vision, Cognition, Learning, and Autonomy advised by Professor Song-Chun Zhu. My research interests include Computer Vision, Machine Learning, and Cognitive Science. Cooperative Holistic 3D Scene Understanding from a Single RGB Image. 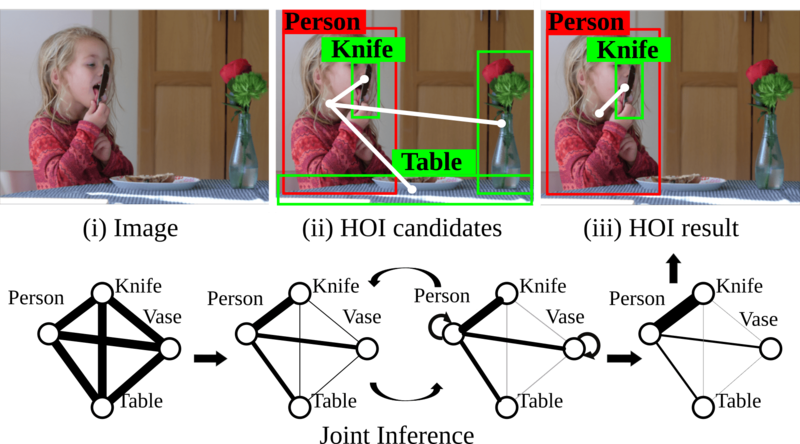 Learning Human-Object Interactions by Graph Parsing Neural Networks. Holistic 3D Scene Parsing and Reconstruction from a Single RGB Image. Generalized Earley Parser: Bridging Symbolic Grammars and Sequence Data for Future Prediction. Configurable 3D Scene Synthesis and 2D Image Rendering with Per-Pixel Ground Truth Using Stochastic Grammars. Human-centric Indoor Scene Synthesis Using Stochastic Grammar. 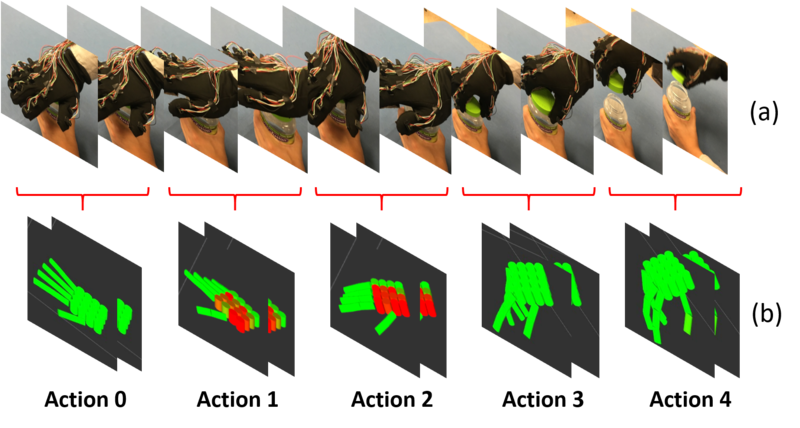 Unsupervised Learning of Hierarchical Models for Hand-Object Interactions Using Tactile Glove. Predicting Human Activities Using Stochastic Grammar. Feeling the Force: Integrating Force and Pose for Fluent Discovery through Imitation Learning to Open Medicine Bottles. [Invited talk] I presented our work on "Examining Human Physical Judgments Across Virtual Gravity Fields" in VRLA 2017. [Oral] The Martian: Examining Human Physical Judgments Across Virtual Gravity Fields. Siyuan Huang, Siyuan Qi, Yinxue Xiao, Yixin Zhu, Ying Nian Wu, Song-Chun Zhu. Holistic 3D indoor scene understanding refers to jointly recovering the i) object bounding boxes, ii) room layout, and iii) camera pose, all in 3D. The existing methods either are ineffective or only tackle the problem partially. In this paper, we propose an end-to-end model that simultaneously solves all three tasks in realtime given only a single RGB image. The essence of the proposed method is to improve the prediction by i) parametrizing the targets (e.g., 3D boxes) instead of directly estimating the targets, and ii) cooperative training across different modules in contrast to training these modules individually. Specifically, we parametrize the 3D object bounding boxes by the predictions from several modules, i.e., 3D camera pose and object attributes. The proposed method provides two major advantages: i) The parametrization helps maintain the consistency between the 2D image and the 3D world, thus largely reducing the prediction variances in 3D coordinates. ii) Constraints can be imposed on the parametrization to train different modules simultaneously. We call these constraints "cooperative losses" as they enable the joint training and inference. We employ three cooperative losses for 3D bounding boxes, 2D projections, and physical constraints to estimate a geometrically consistent and physically plausible 3D scene. Experiments on the SUN RGB-D dataset shows that the proposed method significantly outperforms prior approaches on 3D object detection, 3D layout estimation, 3D camera pose estimation, and holistic scene understanding. Siyuan Qi*, Wenguan Wang*, Baoxiong Jia, Jianbing Shen, Song-Chun Zhu. This paper addresses the task of detecting and recognizing human-object interactions (HOI) in images and videos. We introduce the Graph Parsing Neural Network (GPNN), a framework that incorporates structural knowledge while being differentiable end-to-end. For a given scene, GPNN infers a parse graph that includes i) the HOI graph structure represented by an adjacency matrix, and ii) the node labels. Within a message passing inference framework, GPNN iteratively computes the adjacency matrices and node labels. We extensively evaluate our model on three HOI detection benchmarks on images and videos: HICO-DET, V-COCO, and CAD-120 datasets. Our approach significantly outperforms state-of-art methods, verifying that GPNN is scalable to large datasets and applies to spatial-temporal settings. Siyuan Huang, Siyuan Qi, Yixin Zhu, Yinxue Xiao, Yuanlu Xu, Song-Chun Zhu. We propose a computational framework to jointly parse a single RGB image and reconstruct a holistic 3D configuration composed by a set of CAD models using a stochastic grammar model. Specifically, we introduce a Holistic Scene Grammar (HSG) to represent the 3D scene structure, which characterizes a joint distribution over the functional and geometric space of indoor scenes. The proposed HSG captures three essential and often latent dimensions of the indoor scenes: i) latent human context, describing the affordance and the functionality of a room arrangement, ii) geometric constraints over the scene configurations, and iii) physical constraints that guarantee physically plausible parsing and reconstruction. We solve this joint parsing and reconstruction problem in an analysis-by-synthesis fashion, seeking to minimize the differences between the input image and the rendered images generated by our 3D representation, over the space of depth, surface normal, and object segmentation map. The optimal configuration, represented by a parse graph, is inferred using Markov chain Monte Carlo (MCMC), which efficiently traverses through the non-differentiable solution space, jointly optimizing object localization, 3D layout, and hidden human context. Experimental results demonstrate that the proposed algorithm improves the generalization ability and significantly outperforms prior methods on 3D layout estimation, 3D object detection, and holistic scene understanding. Siyuan Qi, Baoxiong Jia, Song-Chun Zhu. Future predictions on sequence data (e.g., videos or audios) require the algorithms to capture non-Markovian and compositional properties of high-level semantics. Context-free grammars are natural choices to capture such properties, but traditional grammar parsers (e.g., Earley parser) only take symbolic sentences as input. In this paper, we generalize the Earley parser to parse sequence data which is neither segmented nor labeled. This generalized Earley parser integrates a grammar parser with a classifier to find the optimal segmentation and labels, and makes top-down future predictions accordingly. Experiments show that our method significantly outperforms other approaches for future human activity prediction. Chenfanfu Jiang*, Siyuan Qi*, Yixin Zhu*, Siyuan Huang*, Jenny Lin, Lap-Fai Yu, Demetri Terzopoulos, Song-Chun Zhu. We propose a systematic learning-based approach to the generation of massive quantities of synthetic 3D scenes and numerous photorealistic 2D images thereof, with associated ground truth information, for the purposes of training, benchmarking, and diagnosing learning-based computer vision and robotics algorithms. 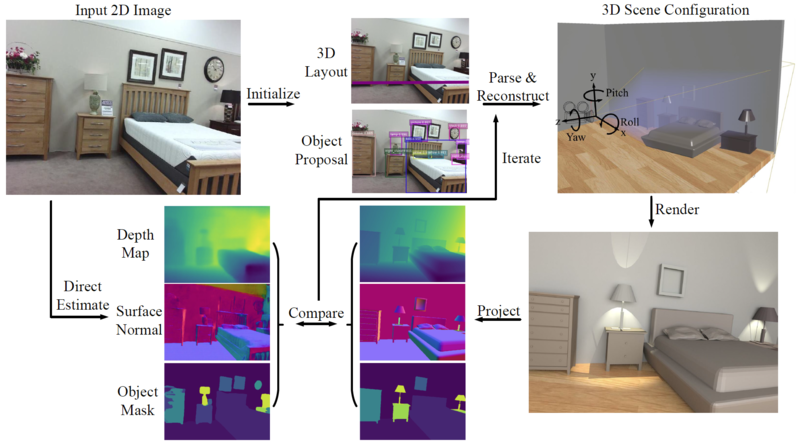 In particular, we devise a learning-based pipeline of algorithms capable of automatically generating and rendering a potentially infinite variety of indoor scenes by using a stochastic grammar, represented as an attributed Spatial And-Or Graph, in conjunction with state-of-the-art physics-based rendering. Our pipeline is capable of synthesizing scene layouts with high diversity, and it is configurable in that it enables the precise customization and control of important attributes of the generated scenes. It renders photorealistic RGB images of the generated scenes while automatically synthesizing detailed, per-pixel ground truth data, including visible surface depth and normal, object identity, and material information (detailed to object parts), as well as environments (e.g., illumination and camera viewpoints). We demonstrate the value of our dataset, by improving performance in certain machine-learning-based scene understanding tasks--e.g., depth and surface normal prediction, semantic segmentation, reconstruction, etc.---and by providing benchmarks for and diagnostics of trained models by modifying object attributes and scene properties in a controllable manner. Siyuan Qi, Yixin Zhu, Siyuan Huang, Chenfanfu Jiang, Song-Chun Zhu. We present a human-centric method to sample and synthesize 3D room layouts and 2D images thereof, for the purpose of obtaining large-scale 2D/3D image data with the perfect per-pixel ground truth. An attributed spatial And-Or graph (S-AOG) is proposed to represent indoor scenes. The S-AOG is a probabilistic grammar model, in which the terminal nodes are object entities including room, furniture, and supported objects. Human contexts as contextual relations are encoded by Markov Random Fields (MRF) on the terminal nodes. We learn the distributions from an indoor scene dataset and sample new layouts using Monte Carlo Markov Chain. Experiments demonstrate that the proposed method can robustly sample a large variety of realistic room layouts based on three criteria: (i) visual realism comparing to a state-of-the-art room arrangement method, (ii) accuracy of the affordance maps with respect to ground-truth, and (ii) the functionality and naturalness of synthesized rooms evaluated by human subjects. This paper proposes an intent-aware multi-agent planning framework as well as a learning algorithm. Under this framework, an agent plans in the goal space to maximize the expected utility. The planning process takes the belief of other agents' intents into consideration. Instead of formulating the learning problem as a partially observable Markov decision process (POMDP), we propose a simple but effective linear function approximation of the utility function. It is based on the observation that for humans, other people's intents will pose an influence on our utility for a goal. The proposed framework has several major advantages: i) it is computationally feasible and guaranteed to converge. ii) It can easily integrate existing intent prediction and low-level planning algorithms. iii) It does not suffer from sparse feedbacks in the action space. We experiment our algorithm in a real-world problem that is non-episodic, and the number of agents and goals can vary over time. Our algorithm is trained in a scene in which aerial robots and humans interact, and tested in a novel scene with a different environment. Experimental results show that our algorithm achieves the best performance and human-like behaviors emerge during the dynamic process. Contact forces of the hand are visually unobservable, but play a crucial role in understanding hand-object interactions. In this paper, we propose an unsupervised learning approach for manipulation event segmentation and manipulation event parsing. The proposed framework incorporates hand pose kinematics and contact forces using a low-cost easy-to-replicate tactile glove. We use a temporal grammar model to capture the hierarchical structure of events, integrating extracted force vectors from the raw sensory input of poses and forces. The temporal grammar is represented as a temporal And-Or graph (T-AOG), which can be induced in an unsupervised manner. We obtain the event labeling sequences by measuring the similarity between segments using the Dynamic Time Alignment Kernel (DTAK). 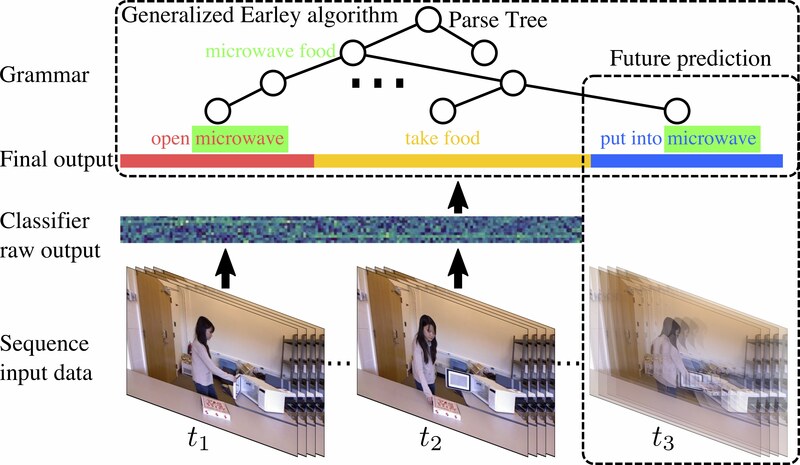 Experimental results show that our method achieves high accuracy in manipulation event segmentation, recognition and parsing by utilizing both pose and force data. Siyuan Qi, Siyuan Huang, Ping Wei, Song-Chun Zhu. This paper presents a novel method to predict future human activities from partially observed RGB-D videos. Human activity prediction is generally difficult due to its non-Markovian property and the rich context between human and environments. We use a stochastic grammar model to capture the compositional structure of events, integrating human actions, objects, and their affordances. We represent the event by a spatial-temporal And-Or graph (ST-AOG). The ST-AOG is composed of a temporal stochastic grammar defined on sub-activities, and spatial graphs representing sub-activities that consist of human actions, objects, and their affordances. Future sub-activities are predicted using the temporal grammar and Earley parsing algorithm. The corresponding action, object, and affordance labels are then inferred accordingly. Extensive experiments are conducted to show the effectiveness of our model on both semantic event parsing and future activity prediction. Mark Edmonds*, Feng Gao*, Xu Xie, Hangxin Liu, Siyuan Qi, Yixin Zhu, Brandon Rothrock, Song-Chun Zhu. Learning complex robot manipulation policies for real-world objects is challenging, often requiring significant tuning within controlled environments. In this paper, we learn a manipulation model to execute tasks with multiple stages and variable structure, which typically are not suitable for most robot manipulation approaches. The model is learned from human demonstration using a tactile glove that measures both hand pose and contact forces. The tactile glove enables observation of visually latent changes in the scene, specifically the forces imposed to unlock the child-safety mechanisms of medicine bottles. From these observations, we learn an action planner through both a top-down stochastic grammar model (And-Or graph) to represent the compositional nature of the task sequence and a bottom-up discriminative model from the observed poses and forces. These two terms are combined during planning to select the next optimal action. We present a method for transferring this human-specific knowledge onto a robot platform and demonstrate that the robot can perform successful manipulations of unseen objects with similar task structure. Tian Ye, Siyuan Qi, James Kubricht, Yixin Zhu, Hongjing Lu, Song-Chun Zhu. Yixin Zhu and Siyuan Huang on Scene Generation and Synthesis. Ping Wei on Human Activity Understanding. Mark Edmonds and Feng Gao on Robot Learning. Jenny Lin, Xingwen Guo and Ye Tian on Virtual Reality.